ExxonMobil wants to restart three dormant offshore oil drilling platforms in the Santa Barbara Channel and truck oil along California’s coastal highways, 24 hours a day, seven days a week. This dangerous proposal would risk potentially explosive crashes by adding 70 oil tanker trucks a day carrying 500,000 gallons of heavy crude along 140 miles of narrow, winding roadways. 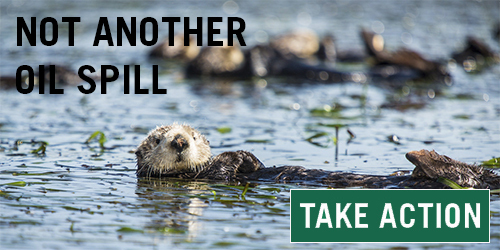 Tell the Santa Barbara County Board of Supervisors to say #ExxonBeGone and help phase out dirty and dangerous offshore drilling along California’s beautiful coastline. When a corroded coastal oil pipeline near Santa Barbara ruptured in May 2015, it spilled over 120,000 gallons of crude, killing hundreds of marine mammals and seabirds and blackening local beaches for miles. It also shut down the seven aging offshore drilling platforms it served. One of those aging platforms is being decommissioned — but ExxonMobil is making an aggressive push to bring its three platforms back online. Californians strongly oppose offshore drilling, which threatens coastal communities and marine life with more oil spills, toxic pollution and greenhouse gas pollution. They oppose President Trump’s reckless proposal to lease federal waters off California to oil companies, they oppose decrepit offshore platforms in state waters, and they certainly oppose Exxon’s plan to truck nearly half a million gallons of dirty offshore oil along dangerous coastal California highways every day. Map courtesy Santa Barbara County. Your support is crucial to our fight to protect oceans.